Variety is truly unlimited in the field of quilts and quilt making. 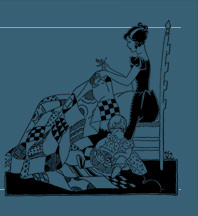 That is one secret of the quilt fascination which charms from generation to generation. So in the quilt pattern above, "Beautiful Star," its name is not its chief claim to distinction, but the beauty of an all-over pattern, that particular "set" which requires no strips of plain squares. It is pieced in a chintz-like calico print which makes part of the block and yet appears to set all blocks together. The block itself is 10 inches square, not as simple as some to piece, and yet when a yellow oil print combines with dull red and "unbleached" in the blocks it makes a coverlet well worth working. 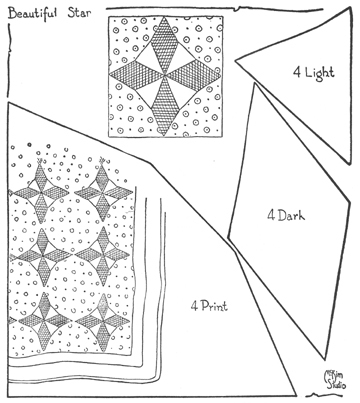 Materials Estimate: In making this quilt, 10 inch squares are set together to make an all-over pattern. Fifty-six blocks are required, 7 blocks wide by 8 long, which, plus a 2-inch border of light color and one of print will finish the quilt about 78 by 88 inches. This requires 5 yards of print, 2 yards of dark and 2 yards of light for making the border, 9 yards in all, which may allow enough for binding.